Specialists have recently detected a new ransomware-infection Mikoyan Ransomware - it has been named after the extension .MIKOYAN it appends to files it encrypts. It has been categorized as ransomware because it has been developed to encrypt files and then demand a ransom. Fortunately, it has not been released to obtain money from users. Researchers say that this Hidden Tear-based ransomware has been originally developed and is used for testing, so it is very likely that you will never encounter it. Of course, cyber criminals might steal it and start distributing it with the intention of getting money from users too. If you ever detect this ransomware infection on your computer, delete it immediately even if it has not encrypted your files. Keeping malicious software installed is always a bad idea because it might be updated at any time. Mikoyan Ransomware is a typical ransomware infection, but it differs from ordinary ransomware infections in a sense that it does not encrypt all files stored on the computer. Instead, it encrypts one folder: C:\Users\rucku\Downloads. Even though all users have a Downloads folder in %USERPROFILE%, their folder paths are different, so users should not find any of their files locked even if Mikoyan Ransomware enters their computers. Of course, we do not know what will happen in the future, so we cannot guarantee that this infection will not be updated. No matter which version of Mikoyan Ransomware you encounter, it will become immediately clear that it is inside your computer because you will see a window MIKYOAN ENCRYPTOR opened on your Desktop. It tells users that all their downloaded files have been encrypted using the AES-256 encryption algorithm and the only way to get them back is to send 1 Bitcoin. Needless to say, there is no point in doing that if you discover that your files are intact. As has already been mentioned, it is not very likely that you will ever encounter this ransomware infection because it has not been developed in order to extract money from people; however, if you somehow get it, there is a 99% possibility that none of your files will be locked. In this case, it is still a must to delete this ransomware infection from the system. Have you discovered your files encrypted and having a new extension .MIKYOAN? If so, you should not go to send 1 Bitcoin because there are no guarantees that this will help you to get files back. Actually, it is possible to recover files encrypted by ransomware infections for free as well. For example, users can recover them from a backup, so if you have found your files locked, do not rush to pay the required money for their decryption. At the time of writing, Mikoyan Ransomware is not being spread actively; however, if this ever changes, there is no doubt that it will be distributed through spam emails mainly. Specifically speaking, it will be spread as a harmless attachment, e.g. an invoice or an important document in these spam emails. It is one of the most popular ransomware distribution methods; however, these infections might be distributed using other distribution strategies as well. For example, cyber criminals might decide to put Mikoyan Ransomware on some kind of third-party page and promote it as useful software. To be frank, there are many malware distribution methods these days, so you would feel safe only if you install a reputable security application on your computer and keep it always enabled. Our security specialists agree that this should be done as soon as possible. 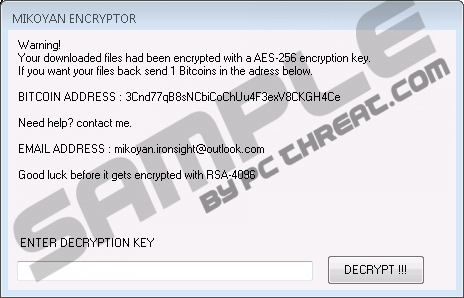 If you have discovered files encrypted by Mikoyan Ransomware, try entering the decryption key: M9K6Y2A0N2:nQW1AVK4m2m1h0aQRkX9v FsSqAYVspm20zH7PvSTVaxgKkDL26mBuJ94qfjfsoVB in the box on the opened window and then click DECRYPT !!!. If it does not work, delete Mikoyan Ransomware and then recover files from a backup. The version specialists working at pcthreat.com have analyzed does not do anything bad – it has been developed for testing, so it is not very likely that there will be many victims of this threat. Undoubtedly, it might be updated, so we cannot promise that you will never encounter Mikoyan Ransomware. Click on the Processes tab to open it. Check the list of processes and kill those suspicious ones (right-click on a process and then click End Process). Launch the Windows Explorer (tap Win+E). Scan your PC with an automatic scanner to leave no traces of ransomware. Quick & tested solution for Mikoyan Ransomware removal.